On February 21, the U.S. Census Bureau released its durable goods report for December. 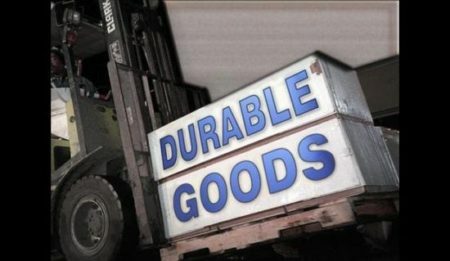 Durable goods orders in December increased by 1.2 percent. For the entire year, durable goods orders showed strength, with orders up by 8.1 percent in 2018 versus 2017. In December, big gains came on the transportation front – which tends to be particularly volatile from month to month. Factoring out transportation, durable goods orders grew by only 0.1 percent in December. An important item to take a look at in this report is the change in nondefense capital goods excluding aircraft orders, which serves as an important gauge of private investment in equipment and software. For December, new orders in this area declined by 0.7 percent, which followed on a drop of 1.0 percent in November, and a gain of only 0.5 percent in October. Even with this late-in-the-year slowing, for all of 2018 nondefense capital goods excluding aircraft orders were up by a solid 6.1 percent. The sluggish measure of investment in the durable goods report for the last three months of 2018 is particularly troubling given that business investment growth had been slowing over the previous two quarters in the GDP data. Private sector investment, of course, is vital to current and future economic and income growth, playing a key role in enhancing labor productivity. From the start of 2017 through the second quarter of 2018, real business investment growth was strong, and gave a boost to overall real GDP growth numbers. That needs to continue. Policymakers must remove uncertainties and threats – such as on the trade front – to stabilize the foundation upon which investment and growth can occur.